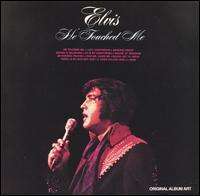 He Touched Me is a 1972 contemporary gospel music album by Elvis Presley. It earned him his second of three Grammy Awards. The album his third and final studio gospel album, and the most contemporary of the three. He Touched Me was certified gold on March 27, 1992 and platinum on July 15, 1999 by the RIAA. Tracks 1-12 are from the original release. ↑ "CG: Artist". Robert Christgau. Retrieved 2012-02-20. ↑ Simpson, Paul (2004). The Rough Guide to Elvis. London: Rough Guides. p. 147. ISBN 1-84353-417-7. 1 2 Bush, John. "He Touched Me". Rovi Corporation. Retrieved January 7, 2012. ↑ "Searchable Database". RIAA. 2015. Retrieved January 13, 2015. Note: Go to "Advanced Search" and type "Presley, Elvis" into the artist section and "He Touched Me" into the album name section. ↑ "He Touched Me". ABG EPE IP LLC. 2015. Retrieved January 13, 2015.